You are currently browsing the tag archive for the ‘avant-garde’ tag. ‘Kreise’ is most probably the first full color film made in Europe. Made with ‘Gaspar Color’ it certainly makes clever use of color’s new possibilities. ‘Gaspar Color’ required too much exposure time for live action, but for Fischinger’s animations it was perfect. Color certainly added a great deal to Fischinger’s films. ‘Kreise’, for example, literally explodes with color. As its title implies, the film is composed of circles, only, which move and grow in various ways on an instrumental excerpt from Richard Wagner’s Tannhäuser. The film ends with a slogan: “Alle Kreise erfasst Tolirag” (Tolirag reaches all circles [of society]), revealing that this totally abstract film is actually a commercial for an advertising agency. This was Fischinger’s trick to get the film past the Nazi censors, who in 1933 had come to power, and who were strongly opposed to abstract art. Later the film also advertised other companies, like the Dutch Van Houten chocolate company. The film clearly shows that Walt Disney was not the only one who knew how to deal with color, but one wonders whether Tolirag (or Van Houten for that matter) did get a lot of new customers out of it. In Fischinger’s study No. 7 , made in 1930-1931, the shapes of Study No. 6 move to the 5th Hungarian dance by Johannes Brahms. Like Study No. 6 Fischinger made this film with charcoal on paper. In this short the synchronization of music and movement is even better than in Study No. 6. Fischinger uses less diverse shapes than in No. 6, making the film more consistent. Some of them look like fluttering and folding pieces of paper. 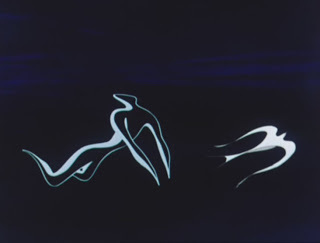 According to William Moritz this particular film prompted four film makers into animation: Norman McLaren, Alexandre Alexeieff, Claire Parker and Len Lye. These four all became major players in avant-garde animation. This fact makes Study No. 7 one of the most important animation films in history. In this short study we watch white shapes moving on a black canvas to upbeat dance music (‘Los Verderones’ by Jacinto Guerrero). Made with charcoal on paper, the result looks like a filmed sketch by Wassily Kandinsky. The only recognizable shape is an eye, which reoccurs a few times. The twirling shapes are elegantly drawn, their movements match the jolly music perfectly, and there’s a feeling of gaiety that transcends the film’s abstraction. In 1931 Oskar Fischinger’s friend Paul Hindemith and some of his students made new scores for this film, but unfortunately they were all lost in World War II. ‘Magic Canvas’ is rather pretentiously introduced as “something different (…. ), new and exciting”. Luckily, the film is rather original and exciting: using a rather abstract score by Hungarian composer Mátyás Seiber, it consists of associative images with a strong sense of surrealism. It loosely tells the story of man struggling to be free. Even though it has to pay its debts to Disney’s ‘Fantasia’ (1940), ‘The Magic Canvas’ surely is one of the most avant-gardistic films of its time, and a testimony of Halas & Batchelor’s animation ambitions.